The science and technology of golf equipment has never interested me much. Undoubtedly that’s because my brain was simply not wired toward science or technology, from birth. But much of my career was spent in advertising and marketing, so the advertising and marketing of golf science and technology HAS interested me. And the cynic in me has always been very sceptical of the hyperventilating claims of golf equipment manufacturers, and the publications and video programs that give them unquestioned coverage. I’m not saying that any manufacturers’ ads, or varied claims of “better” performance, are wrong or exaggerated. I don’t have the – er – science or technology to properly test their accuracy or veracity. I also don’t have the time, skill, or interest to determine whether I personally would hit a ball farther, straighter, more consistently, or with better “feel”, if I used one brand of clubs over another. I figure that somewhere out there, on some range or some course, or some simulator at the back of a golf store, some guy or woman is going to pick up a set of any brand of golf clubs, hit a few balls and say, “boy, these clubs are perfect for me! I definitely hit it longer, straighter, and more consistently.” Boom. Advertising validation! So far be it from me to say that most or all golf equipment marketing (and science and technology) is a crock. Obviously, throughout the decades, the improvements in golf equipment have been unquestioned. Golf balls – beginning with the advent of the Haskell ball about 125 years ago — have had probably the most amazing transformation, especially without significant appearance changes. (It’s still a white sphere, 1.68 inches in diameter.) There’s no question they fly farther, straighter, and more consistently than they did 25, 50 or 100 years ago. I still have some Titleist balatas in the basement, dating from 1995; I keep thinking I must take them out to a range and compare them to a Pro-V1. I wish I had a Spalding Dot from 1965 for the same comparison, or a Dunlop 65 from 1945. I bet there’d be a big difference. The advent of metal woods in the late 70s was a total game changer for the industry, and generally for the people who play the game. Shaft technology has had a dramatic effect on club performance, too. So, with all these advances, we should all be playing much better golf, and shooting lower scores, right? Uh, we all know the answer to that one. Since I started playing with adult golf clubs in the early 1960s, I’d say I’ve owned maybe 12 sets of irons… at least 12 drivers, and probably as many 3-4-5 woods. At my peak in the 70s and 80s, when I played to about a 5-handicap, I might hit my best drives 245-255 yards. Today, with the Taylor Made M2 which I love, and the best balls in my bag, I’m lucky if I get 220 – but that’s because I’m now in my late 60s, not because of the equipment. But distance aside, do I feel my equipment today is better than it was 25 or 50 years ago? Not really. The drives may be consistently straighter, but I can’t claim that my M2 gives me any more distance or better “feel” than my Campbell Arnold Palmer driver in 1969 or my Great Big Bertha in 1994. I love the feel of my current Callaway irons, on the rare occasions when I strike the ball properly; but am I longer or more accurate than I was in 1994 with my first-generation Nicklaus N1s? Definitely not. 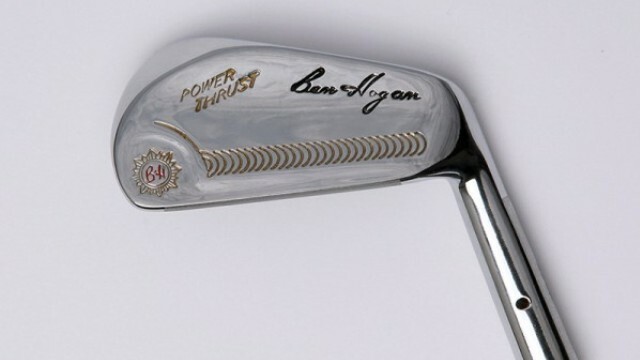 In fact, if there’s science or technology in golf that I truly miss, it’s a set of Ben Hogan lightweight steel shaft irons that I played from 1969-1982. I was truly deadly with these clubs, I felt that we were truly made for each other back then. So why did I give them up? Because of the advertising and marketing of golf science and technology. I can’t now remember what I traded my Hogans in for, but they never worked as flawlessly as the sticks that I so coldly and willfully discarded. A few years later, I won a set of Ping beryllium copper irons in a raffle and tried to play with them for about three years. I don’t think I hit one good shot with these clubs, but they sure looked rich sitting in my bag. About five years ago, I went onto eBay to try to find a set of those old Hogan irons. I couldn’t find any, sadly, but I ended up buying a set of 1990-vintage Wilson Staff irons. Boy did they look classic in the photos! Anyway, the point in all this – and there always is a point, eventually, dear reader(s) – is that, in my humble opinion, the BEST clubs money can buy, and the BEST science and technology, are the clubs that you feel BEST playing with… regardless of age, brand, appearance, fashion, style, or cost. If you’ve got a set that you feel good with right now, DO NOT succumb to advertising, marketing, frustration, embarrassment, a personal sales pitch, or your friends or children saying you look like an idiot with those things. Those clubs are the BEST you’ll ever own. So, play on, my friend.